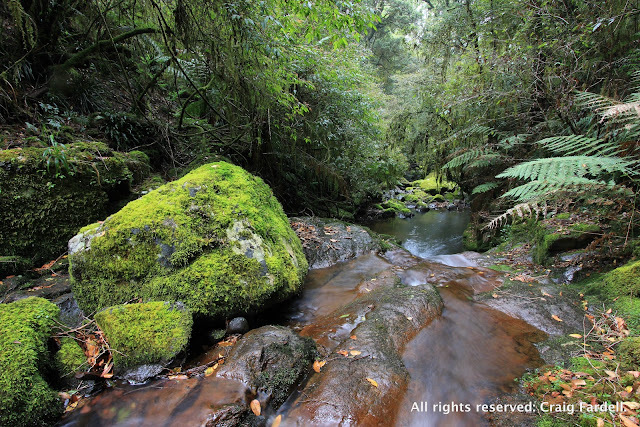 I am trying to put my finger on the cause of this left-over yearning following last weekend’s walk – an off-track meandering along Five Day Creek in New England National Park. Back at the day job now, the feeling is being fed by sounds of a power-saw in the industrial estate across the highway, ambulances screaming in and out of the nearby hospital, the thousand trucks a day roaring past on the highway: everyday things in this town, but not for a body desperate to return to the wilderness it walked out of on Sunday. Word of mouth is a great tool for those seeking new places, beautiful landscapes, big or small adventures. In a way, it's what this blog is about. Here is a place that came to us via word of mouth from a group of intrepid bushwalkers and members of the Inverell Bushwalking Club. We met the club members one October long weekend while hail, fog and snow trapped us on top of Mt Kaputar. Huddled under a small shelter in the campground we sipped hot cups of tea, wearing every stitch of merino, gortex and polypro available, listening to details of their club’s favourite walks and destinations – all of them, funnily enough, in sunny warm locations unlike our surrounds. The conversation turned to the Mann River Nature Reserve, west of Grafton. For a long time we had thought about exploring up the Mann River, from the campground on the Old Glen Innes-Grafton road. The Inverell walkers rekindled our interest with talk of an old walkers' hut beside the river, built by a man named Devine. Obviously, it is called Devine Hut. And Devine by name, but divine by nature.